â€˜â€˜We can wipe out our losses in three yearsâ€? Can the ‘King of Good Times’ survive the turbulence in the current aviation downturn? 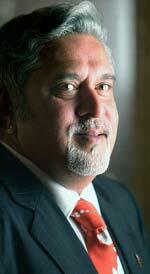 In an exclusive interview that started well past midnight and continued for over two hours at his residence on Delhi’s tony Sardar Patel Marg, Mallya shed light on what has been dragging Kingfisher down and how he will get the airline flying high again. How do you see the aviation business panning out in the current environment? In India air traffic is vital; it is not an option. Given the geographic size of our country and the GDP growth, aviation will always have a bright future. There is no dearth of demand. It all depends on what you are comparing (today’s situation) with. If you are comparing today’s position with the 30 per cent CAGR (compounded annual growth rate) of the last three years, you are making a fundamental mistake. A 30 per cent CAGR is not sustainable in any industry. We have reached a new level based on that growth. The whole base has moved up from 14 million to 45 million passengers; 30 per cent on 14 million is hell of a difference from 5 per cent on 45 million. That’s on one side. On the other, many airlines added a lot of capacity. Captain Gopinath (Non-Executive Vice Chairman of Kingfisher Airlines), who at every opportunity likes to criticise the way I run Kingfisher, says prices should be rock-bottom in order to stimulate demand. He talks about this country requiring 1 billion seats. I have never believed in that business model. So, where do you see the problem? Growth has slowed due to a multiplicity of factors. The growth of civil aviation is normally twice that of GDP growth. Even if there is a 6 per cent GDP growth, aviation will grow 12 per cent. The airport charges are too high. The industry is overtaxed. If you see Hyderabad, the fuel price, after a 4 per cent sales tax, is Rs 35,662 (per kilolitre), while the same in Bangalore costs Rs 41,285 after a 28 per cent tax. You tax any industry at 25-30 per cent, and figure out for yourself whether that industry has any chance of survival. To me, it is like a guillotine. Look at what state governments are earning: Andhra Pradesh earns Rs 1,371 (per kl) while others earn an average of Rs 9,000 in taxes. This is at today’s fuel prices, which are one-third of what they were six months ago. That’s the reason for our dues to the oil companies going out of control. In its last Budget, the (Union) government was pleased to say aircraft under 40 tonnes max take-off weight will have a 4 per cent tax (declared goods). But those heavier than 40 tonnes have this punitive (sales) tax. So effectively, you are taxing Boeings and Airbuses. The so-called airports to which the government wanted to encourage connectivity, in the past, had turboprops landing there. Airbuses and Boeings are landing there today. They are connecting rural India. That’s why Kingfisher alone has suffered a burden of Rs 750 crore. If the government can amend the law, bringing ATF (aviation turbine fuel) under declared goods, every airline will go from red ink to black ink. And I have committed (that) we will lower prices to stimulate the earlier demand. That will help wipe out your losses? In three years, we can wipe out all the losses (estimated at Rs 2,500 crore). In India, we are performing a vital national service. Kingfisher connects 69 destinations daily with 450 plus flights. There are several places where only Kingfisher operates such as Dehradun, the capital of Uttaranchal. I am the world’s largest operator of ATRs. We ordered and got these aircraft to serve a very specific purpose. Today, you cannot go and buy 20 ATRs. You will get delivery only after 2012. There is a severe shortage worldwide of ATR pilots; 90 per cent of my ATR commanders are expats. Giovanni Bisignani (Chairman of the International Air Transport Association or IATA, a global airline body) has said India is among the most expensive places on the planet to buy ATF. We are among the lowest-cost operators of an airline in India today. We run an efficient operation. You can be as operationally efficient as you want. But you cannot fight a punitive tax. Why cannot the tax be the same for all aircraft? Andhra Pradesh has done it; Kerala has done it. Andhra is recovering much more revenue because we are all fuelling in AP. We are carrying fuel out of Hyderabad to avoid fuelling in Mumbai. What I am asking is to be treated fairly. Oil prices have come down, but what about the 25 per cent depreciation in the rupee? We pay maintenance cost in dollars. Where has my cost gone down? Costs have gone up in lease rentals and maintenance. That is why we need this declared goods status (on ATF). So, is the industry still unviable in spite of low oil prices? It is not the question of being unviable. Thankfully, because oil prices have come down we will breakeven. Some people make the mistake of classifying all airlines as one. Please give us a break. IndiGo, Spice and Paramount have less than 20 planes. Jet Airways and Kingfisher fly 85 plus aircraft each— 170 aircraft between the two of us. The comparison is like chalk and cheese. As a result of tax, we have no choice, but to increase our fuel surcharge. Today, fuel surcharge is more than the basic airfare. We (Kingfisher) still have a 10 per cent overcapacity situation in India. My plan is to use same Airbus that fly domestic to fly neighbouring destinations outside India where costs are lower and yields are higher. How important is it for Kingfisher to get foreign direct investment (FDI)? Aviation requires a level playing field in tax and in policy. We are discriminated against both in tax and in policy. Give us a level playing field. We are capable of fighting international carriers. How does it feel to you as an Indian when 75 per cent of all traffic in and out of India is controlled by foreign airlines? This is the only country in the world that has three designated carriers—Kingfisher, Jet and Air India. It is our money, our taxpayer money, our India money. I would like to see it reverse. I would like to see Jet, Kingfisher and Air India have 75 per cent of traffic and others 25 per cent of business, like anywhere else in the world. I have applied to government to review the policy (currently no foreign airline is permitted to invest in the aviation sector). I am entitled to go to the government. If you can have 100 per cent FDI in airports or steel, what is wrong in an airline (getting foreign investment)? Who can appreciate the value of an airline in a growing market like in India more than a foreign airline? Any airline will value another airline much, much higher (than perhaps a financial investor would). So, you are keen to have a partner? It is not a question of partners. If today you want to raise serious capital for doing anything, a strategic investor would give you a far better value than a normal non-strategic investor would, particularly in this environment of a meltdown. Companies, in today’s bearish scene, are undervalued by up to 80 per cent. A strategic investor thinking long term is likely to value your business far higher than a normal stock market investor. If we are given a level playing field, Kingfisher will become a positive contributor to UB Group. We can make huge money if we are not penalised.